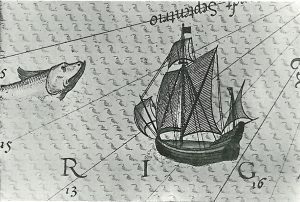 1558, Illustrates the growth of the spritsail boat (from a Dutch chart in C.H.Coote’s Collection of Remarkable Maps of the Fifteenth, Sixteenth and Seventeenth Centuries). What is assuredly the greatest difficulty of the whole inquiry lies in wait for him who seeks to illustrate the steps by which the type of vessel known as the yacht was evolved. This much we may reasonably allow without any quoting of chapter and verse, that a private yacht must be capable of being handled easily by very few men. It was probably largely because this condition was so long awaiting fulfilment that some fitful attempts at pleasure-sailing were not made far earlier than they were. If Henry VIII. had possessed a fore and aft rigged boat in 1532, he would not have paid eighteen men to row him to Sheppey; if Ferris or Taylor had been able to come by any such craft, we may be certain that they would not have made their adventurous journeys chiefly under oars. The pastime of sailing, as has been insisted upon above, could not have become popular while pirates infested the Channel, but a weatherly sailing-boat would have been at a considerable advantage against a pirate who was probably square rigged. The inclination is strong to decide that if a suitable rig had been in existence something would have been heard of it; and conversely that, as we have no direct evidence of its existence, we may assume that it had not yet come into being. Very little indeed is known of any type of medieval ship. A large number of writers – it would be invidious to mention them – have written what purport to be complete historical treatises on the evolution of shipping; but all these books fail lamentably. The great majority of the authors have been, and continue to be, content to copy from their predecessors, and inasmuch as too often they do not know which of these predecessors may be regarded as an authority and which not, they have for the most part gone very far astray. Some comparatively modern writers, such as John Charnock, have done well for recent centuries; two – Sir N. H. Nicolas and that learned Frenchman M. Jal – devoted a large share of their lives to the elucidation of the mysteries of early medieval shipping. Their success, however, was, unfortunately, only partial. They collected vast numbers of new facts, but not enough to enable them to arrive at definite conclusions, and they did not extend their inquiries far into the fifteenth century. The result is that the period directly before the accession of Henry VII., the most interesting period imaginable in the history of the ship, is all but a total blank. We know that during this period the ship gradually took upon herself a rig of her own: she became three-masted, or in the case of great ships four-masted, the topsail was introduced, and, what is more valuable here, the lateen was imported to serve as a mizen. No one has yet shown when the lateen mizen came into use in England. The matter is one of considerable importance, for the lateen was almost without a doubt the first fore and aft sail to be used in England. It is known to be of Southern origin, and for present purposes it will suffice to say that it has been a native of the Mediterranean since long before England was England. Many opportunities have offered of introducing it into England. The Crusaders of the eleventh and twelfth centuries must have known it, but they did not adopt it. It was frequently seen in English waters during the continual fighting of the fourteenth century, for Genoese and other Mediterranean galleys were constantly employed by our enemies. And again, in the same century, the Venetian galleys had a regular trade with Southampton, coming thither yearly in a small squadron during the latter part of the century. It is possible that these Mediterranean galleys were not without their influence, but the thesis which is in favour at present among naval historians is that we adopted the lateen mizen when we took into the navy the great Spanish carracks which figured among the prizes won from the French during the hard fighting of 1416 and the following year. It is a very probable theory, and it agrees with known facts; but it must be remembered that the adoption of the lateen for great ships by no means proves that it ever became popular for small craft, and there is no evidence that such was the case. Towards 1500 the reputation of the ‘deliver sailing’ of the Portu­guese caravel had reached England, and during the next century a much modified copy of the type had something of a vogue. This was the ‘carvell’ of Newcastle, a collier which ‘went with mizens,’ ‘whose sails stood like a pair of tailor’s shears.’ Ralegh thought that the weatherliness of these carvells might be turned to account in war; but Sir Henry Manwayring, practically his contemporary, and a far higher authority on matters maritime, wrote, ‘we have little use of them.’ They seem, in fact, to have quite died out. Possibly the full form of hull imposed by the rough waters of the North was unfitted to that shape of sail. 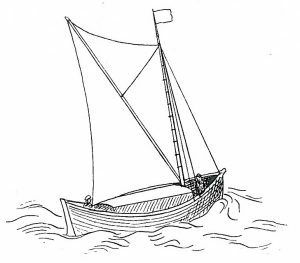 However, what we do know with approximate certainty, from the drawings of John Rous, is that the lateen mizen found a place in English ships at the middle of the fifteenth century. And it may have been introduced perhaps half a century earlier. So much for the germ of the fore and aft rig. 1514, The ‘Great Boat’, or long boat, of the Henry Grace à Dieu. Approximate sail plan (from the inventory in Oppenheim’s ‘Administration of the Royal Navy’. The fifteenth century ends with the lateen mizen well estab­lished, great ships on both sides of the Channel having two lateens, a main mizen, and a bonaventure mizen. But in our waters it was never used save as a mizen, and in the carvells. It was seemingly never even tried as a boat sail. A curious illustration of this is given by the manner in which the ‘great boat,’ or launch, of the famous Henri Grace de Dieu was rigged in 1514. There was no distinctive small boat rig beyond, perhaps, a single square sail, so the deter­mination was taken to rig the boat as a model of the great ship. Accordingly, she was rigged with four masts and a main topmast, and must have presented much such an appearance as is shown by the conjectural drawing here given. The details of her equipment, the number of shrouds to each mast, and the like, are known, and it is clear that the whole lot of masts, spars, rigging, and sails, had to be put into her every time she was to be used. The long-boat was towed astern, never hoisted aboard at this date, and she was never towed with her spars standing. Of course, this cumbersome rig must have been very much in the nature of an experiment, just as was that of the parent ship. We know, from the same inventory, that the Henri Grace de Dieu really possessed the grotesque sails which appear in the popular descriptions of her; but it is in the last degree unlikely that she ever used them on service. The inventory belongs to a date before she was commissioned, and included top­gallant sails, amongst other things. The idea of the topgallant was even older, but the use of it was not yet. For various reasons, which need not be entered upon here, it was found impossible to take them into anything like general use for more than 100 years to come. Thus the rig of the Great Harry was incontinently cut down, and was not repeated. Similarly, we might suppose her boat’s rig to have been reduced, even if we did not know that at or about this time a fore and aft sail of special type was coming into favour among Northern nations. This was the spritsail, and its advent marks an enormous advance. The earliest illustration of it which the writer has been able hitherto to trace is taken from an English map of 1527. How long it existed before this date it is impossible to say. 1585. Showing Galliot Hoy without square sails (from Lucas Wagenaer’s ‘Spieghel der Zeevaert’). Tierra del Fuego and the Cape of Good Hope. The next illustrations of importance belong to 1558, and show very many spritsail boats in Dutch waters, one of them being obviously decked with a coach-house roof amidships. But as yet the day of foresails had not come. 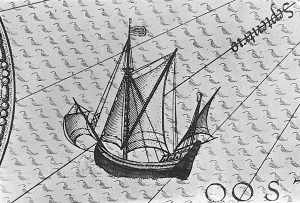 It must have been soon after this date, however, for it appears first in a drawing of about 1568, in a boat having no bowsprit and rigged simply with sprit mainsail and forestay-sail; and by 1583-1585, for which dates many illustrations are available, the forestay-sail had become universal in conjunction with the sprit mainsail. It will, no doubt, look curious to modern eyes to consider these galliots and hoys of the reign of Queen Elizabeth. The earlier type of hoy had no mizen, the galliot-hoy had a lateen mizen; both alike had a sprit mainsail, a forestay-sail, and a square spritsail under the bow­sprit. The jib was not yet invented. If further evidence of this fact were necessary, it might be found in the snaking on the double topmast forestays, which occurs fairly frequently. 1585. 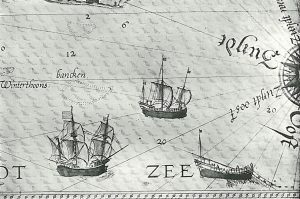 Showing full-rigged ship of the period and two busses, one under sail, the other fishing (from Lucas Wagenaer’s ‘Speighel der Zeevaert’). Curious as it may seem, the lugsail had hardly come into existence at this date, if we may judge by the pictures available. There is one belonging to this period, 1583, but none of earlier date, and the name, as distinct from the thing, does not occur till the eighteenth century. It has been suggested that the doggers of the Middle Ages had lugsails, but the suggestion does .not admit of proof. Indeed, it is one of the main difficulties of these early inquiries that clues whereby names may be fitted to the types that occur are few and far between. There are names enough and to spare, and there are occasional nameless illustrations which ought to absorb some of them; but, pending further information, the names and the things remain apart. In brief, we know ships, barks, hoys, galliot-hoys, caravels, galleys, busses, and a few more, but as to what crayers, doggers, evers, and very many other types looked like, we have little or no certain information. 1585. Showing Galliot Hoy, with sprit-mainsail, square main and main topsails, lateen mizen, fore staysail, and square spritsail or bowsprit (from Lucas Wagenaer’s ‘Speighel der Zeevaert’). A further unsatisfactory thing is that it is impossible hitherto to say in what country the fore and aft spritsail or the forestay-sail originated. We know that they were of Northern origin, and we know very approximately their date. But whether the credit of them is to be given to the English or the Dutch we do not know. The leeboard appears to be characteristically Dutch, though when it had its beginning is very far from clear. But a very interesting point occurs here. In 1531 Pizarro discovered the Peruvian balsa, having an undoubted centre-board. The fact seems to have become fairly well known, but the idea slept unused, and we do not hear of it again for nearly half a century, when the following interesting description of it occurs. What does not appear is whence Bourne drew his inspiration. He was an ingenious man, and may have evolved it out of his inner consciousness, but it is much more likely that the germ, at least, of the idea came to him from a con­versation with some seafaring friend who had heard of the balsa. However that may be, Bourne’s ‘devise’ is manifestly a very great improvement on the balsa. The thing is in almost every respect identical with the modern centre-board, and, considering that Bourne’s book in which the above passage occurs was perfectly well known, both during his lifetime and after, it is not a little remarkable that the adoption of the centre-board was so long delayed. It is satisfactory to be able to trace the origin of the centre-board even thus approximately. But, unfortunately, we have very little precise knowledge of how, when, or where the leeboard took its rise. It is, seemingly, such a very obvious device that we might almost have expected to find traces of it in the dark ages; but this is far from being the case. Perhaps it is not unfair to infer from Bourne’s suggestion for a centre-board that no corresponding ‘devise’ of any kind existed in his day. It is at least certain that, had the leeboard been in use, his remarks would have had far less point. The flat-bottomed bilanders and plates which he mentions occur often enough in sixteenth-century writings, but no one of earlier date than Bourne seems to have thought that it might be possible to make them more weatherly. And not only is there an utter absence of the leeboard from the written page, but it is equally absent from all drawings of small craft till some time after Bourne wrote. In the illustrations of hoys and so forth which are given in this chapter there is no trace of any leeboard, and, indeed, none is to be found at an earlier date than 1585, the year to which the latest of these illustrations belong. They appear first in a plan, or bird’s-eye view, of the town of Gouda, drawn in 1585; but, unfortunately, the drawing is not distinct enough to be worthy of reproduction, though, on the other hand, it is clear enough to establish the fact with reasonable certainty. But it is worth notice that, in the very many illustrations of shipping which occur in this book for the period between 1574 and 1585, there is no other trace of the leeboard; and it is also noteworthy that there seems to be no early written record of its use. That this is so is due in part, perhaps, to the fact that we do not know too well how to look for such a record. The term ‘lee-board’ certainly was not introduced until very long after the thing, and what name was applied to the thing in its early days we cannot say for certain. Perhaps it was called a ‘plate,’ after the flat-bottomed craft to which it was first fitted; it is at least certain that this was its French name early in the seventeenth century. 1585. Showing Hoy, with Sprit Mainsail, Fore staysail, and square sprit-sail under bowsprit (from Lucas Wagenaer’s ‘Speighel der Zeevaert’). ‘Heus (i.e., hoys) du Havre de Grace, Flandres, et Angleterre, du port au plus de trois cens tonneaux sont equipez d’autre façon que les Navires communs . . .’ and then, after giving a description of their rig, which corresponds exactly with that shown in the illustrations of 1585, with studding-sails added, the author con­cludes thus: ‘A chaque bord ou coste, ils ont des grands bois en forme d’ailes ou nageoires de poisson nommés Plates, affichez par des chevilles de fer.’ The nature of the description, which is more minute than he gives to well-known things, would seem to show that even in 1634 the leeboard was by no means universal. Perhaps some future inquirer may succeed in tracking the leeboard to its origin; at present it is only possible to say with certainty that it was beginning to be used in Holland in 1585, and that it was well established in Northern Europe half a century later. Whether it was invented in Holland or in England is quite uncertain, though at first sight such evidence as there is would appear to favour the Dutch. The suggestion that it was introduced into Holland during the Spanish occupation by men who knew the secret of the balsa may be discounted, for if Spaniards had had anything to do with introducing it into the Low Countries, we would at least expect to find it in use in Spain also. But we do not do so. The earliest instance of yachts with leeboards belongs to 1638. In that year Queen Mary of France visited Amsterdam, where a review of yachts was held in her honour. Mr. Clark gives a most interesting reproduction of a contemporary illustration of the event, showing that these yachts had not only adopted the leeboard, which, as we have seen, was by now in common use among hoys, but that the gaff and boom were already popular, and that the principle of two fore and aft rigged masts was being tested even at this early date. It is true that another illustration shows a similar yacht ostensibly belonging to 1600; but, unfortunately, there is no statement of the evidence on which the claim to such an early date rests, and a great ship which appears in the back­ground of the same picture clearly belongs to a later date. The internal evidence tends to show that the picture is approximately contemporary with that of 1638. It is unfortunate that the dates assigned to others of Mr. Clark’s most interesting pictures do not seem to be above suspicion. 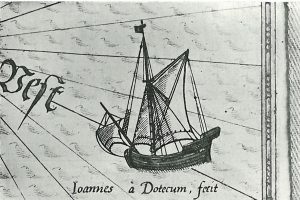 Thus, a yacht said to have been owned by Maurice of Nassau shows a mainsail with a long gaff, but no boom, a square topsail such as hoys carried in 1585, a forestay-sail, and a bowsprit on which a jib may have been set. There is nothing intrinsically improbable in the suggestion that such a yacht was in use in 1625, but the statement needs confirmation, especially as the square-rigged ships in the background show improvements of rig which had not then been introduced, and as Maurice, who was born in 1604, was in 1625 either at the university or in the camp. Similarly an illustration assigned to 1630 can hardly be accepted, although the rig of the yacht shown – spritsail, staysail, and bow­sprit without a jib set – is quite probable for that date; but the author of the original picture was Carel Allard, and he flourished half a century later. But although the whole of Mr. Clark’s illustrations for the pre-Restoration period cannot be accepted, yet it may be granted at once that the net effect of them is to show conclusively that the gaff and boom were introduced in the early part of the century. They illustrate also the adoption of the jib, though on this score there is some uncertainty; and they show that the square topsail was used at an early date in yachts, while the fore and aft or gaff topsail did not exist either then or, indeed, until long afterwards. Nevertheless, although these pictures are of undoubted interest as illustrating the development of a convenient rig for pleasure craft, it must be admitted that they have little or nothing to do with the rise of the sport in England. All the yachts represented during the pre-Restoration period are Dutch, for English yachts did not as yet exist. It is, indeed, often loosely stated that in 1604 Phineas Pett built a ‘yacht’ for Henry, Prince of Wales. In actual fact the little vessel was far from being a ‘yacht’ or pleasure craft; she was an instruc­tional model built with the express purpose of giving the young Prince ‘instruction in the business of shipping.’ The Lord High Admiral, to whose order she was built, was the Earl of Nottingham, who, as Lord Howard of Effingham, had commanded in chief against the Armada with his flag in the Ark Royal. What more natural, therefore, than that this famous old ship, which was still on the active list of the navy, should be chosen for reproduction in miniature? The model, duly finished in March, 1604, was 28 feet by the keel with a beam of 12 feet, and was estimated to be of 30 tons burden. She was ‘baptized’ with proper ceremony, receiv­ing the name of Disdain, but to what extent she was used after the inaugural ceremonies is a matter for conjecture. It is certain, how­ever, that the nautical tastes of the Prince did not decline. In 1608, being then fourteen years old he paid a visit of inspection to Woolwich Dockyard, where he was especially interested in the first beginnings of the Prince Royal, the great ship which was launched in September, 1610, and was nominally presented to him by the King. Such a presentation justified biographers in speaking of the Prince Royal as the Prince’s own ship, but it was in reality no more than a formal compliment. However, in June, 1612, Pett began to build a small new ship which was to serve as a pinnace to the great ship. A pinnace at that date, it should be remembered, was not a ship’s boat, but a sea-going tender and ship-rigged. The pinnace in which Prince Henry proposed to sail the narrow seas was of 250 tons burden, being 72 feet long by 24 feet beam. But dis aliter visum, and she was never used for that purpose. The Prince died on November 12 of that year, before she was finished. The mention of this model ship brings us in touch with the square rig of the period, and although this branch of the naval art does not, strictly speaking, fall within our province, some short mention of it may be justified. There is a prevalent misconception about the state of development which had been reached, and even serious historians appear to believe that the topgallant sail was in common use at this date. As a matter of fact, the Ark Royal, the flagship in 1588, had one topgallant sail, and seemingly did not use it; the Victory had two; other ships had none. The use of these sails came in very slowly, and they were not carried for winter cruising, strange as the assertion may seem, till the eighteenth century. In Elizabeth’s and James I’s reign great ships were what we should call barque-rigged, with one or two lateen mizens, but no topsail, with courses and top­sails on fore and main, and a spritsail on the bowsprit. The mizen topsail, the spritsail-topsail, and – in the case of small craft – stay­sails were gradually introduced during the reign of Charles I. It is at least sufficiently remarkable that the clumsy and inefficient sprit­sail-topsail was being invented and introduced for big ships at the exact period when the jib began to be used in small craft. Obvious as the jib may seem to modern eyes, it should be remembered that it was long in forcing itself into favour. Van der Velde’s pictures show that even during the reign of Charles II. it was not often set, even by the small craft which were rigged to carry it, and a century was destined to pass by before it succeeded in ousting the square spritsail -topsail from square-rigged ships. The seventeenth-century idea was that it was ‘very prejudicial’ to sailing on a wind.